MOUNTAIN VIEW, CA--(Marketwired - Jun 12, 2013) - Following the introduction of AgilOne Enterprise Edition in November of 2012, the leader in cloud-based predictive marketing analytics, today announced the availability of AgilOne Email Edition to make it even easier for all marketers to get started with predictive marketing. Designed to leverage powerful, self-learning algorithms, AgilOne Email Edition helps marketers reach their target audience with tailored content to reduce the number of irrelevant emails that customers receive. AgilOne is also introducing the results of a recent joint survey with Harris Interactive that signals a growing disconnect between marketers and consumers. According to the survey, many shoppers can't recall one successful email marketing campaign they received in the past year. Traditionally, email marketers have relied on "batch and blast" methods for distributing identical content out to a large number of consumers. According to a recent study, 79 percent of Americans say that checking email is a waste of time, resulting in high rates of email unsubscribe. For every dissatisfied customer who unsubscribes, marketers lose on average 60 percent of their future lifetime value and potentially millions of dollars in revenue. "We selected AgilOne in order to retain and grow our value in the eyes of our subscribers while ensuring that we weren't losing customers because they were disappointed in the frequency or our email marketing efforts," says Sarah Schaale, Marketing Communications Manager at Lumens.com. "I am excited about the promise of predictive analytics in this regard, and about AgilOne which is bringing data science previously only accessible to Fortune 500 brands to everyday marketers." 52 percent of marketers send the same content and product offers to all consumers. 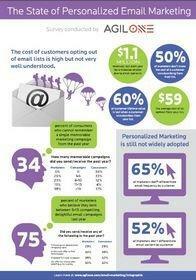 65 percent of marketers do not differentiate how often they send you emails. Only 50 percent of marketers try to re-engage lapsed customers with special offers. Only 39 percent of brands send loyal shoppers special rewards. "One-size-fits-all marketing programs are not only ineffective and intrusive, but they ultimately result in high numbers of alienated customers turning away from a brand," said Omer Artun, CEO of AgilOne. "AgilOne was founded as a 'data scientist in the cloud' for high volume marketers. Today's introduction of AgilOne Email brings this advanced predictive technology to email marketers searching for a smarter, faster way to do their job." As the leader in cloud-based predictive marketing analytics, AgilOne helps businesses figure out how to delight customers next by using a data-scientist approach to marketing. Its unique technology -- based on the science of machine learning -- allows marketers to not only understand their customers better based on the massive volumes of data they collect, but to predict what customers will do next based on their behavior. AgilOne is a cloud-based predictive intelligence application for marketers. It is used by brands including Shazam, Sports Authority, Moosejaw, ideeli, and shopPBS.org. AgilOne helps marketers connect with the individual in every customer. AgilOne prescribes exactly the right marketing offer, makes each relationship more profitable, and simplifies the science of marketing. Based on a data-scientist approach, AgilOne makes big customer data clean and smart. Then, AgilOne recommends what immediate actions to take to increase revenue. AgilOne is based in Mountain View, CA and is venture-funded by Sequoia Capital and Mayfield Fund. For more information, please visit www.agilone.com. This survey was conducted online within the United States by Harris Interactive on behalf of AgilOne from May 29-31, 2013 among 2,085 adults ages 18 and older. This online survey is not based on a probability sample and therefore no estimate of theoretical sampling error can be calculated. For complete survey methodology, including weighting variables, please contact Chris Fucanan.